A new study has indicated that drinking two cups of hot chocolate can help stave off Alzheimer's and boost memory in elderly people by nearly one-third. The study, conducted by Harvard Medical School in Boston, saw 60 volunteers drink two cups of hot chocolate a day for a month, after which memory and thinking skills were tested. At the end, an 8.3% improvement in blood flow to the working areas of the brain was recorded with recall times falling from an average of 167 seconds to 116 seconds. 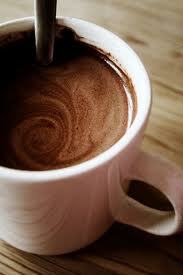 The results are thought to be due to chocolate’s ability to increase blood flow to the brain. Study lead Dr Farzaneh Sorond said: "We're learning more about blood flow in the brain and its effect on thinking skills. Dr Doug Brown, Director of Research and Development at the Alzheimer's Society, said the findings were interesting but that more work must be done. He said: "We know that poor blood flow can affect people's brain power because they don't have enough fuel in their brain cells to complete tasks efficiently. From this small but interesting study, it seems that cocoa helps improve blood supply to the brain, therefore having a knock on effect of improving people's cognition.